Good news for chocolate fans: eating moderate amounts of chocolate may not increase your cholesterol and could even play a role in lowering blood cholesterol levels. However, the benefits of eating chocolate depend on the type of chocolate and the amount you consume. High cocoa content beats low-cocoa chocolate for health benefits. If you have high cholesterol, consult your doctor before adding chocolate to your diet. Most chocolate contains fats, with varying amounts depending on the type. However, dark cocoa-rich chocolate generally contains little to no cholesterol. Milk chocolate does have low levels of cholesterol from the added milk. Overall, dark chocolate offers more health benefits than milk chocolate. White chocolate lacks many of the antioxidant properties of dark and milk chocolate and contains fat-rich cocoa butter, yet even this cocoa butter doesn't increase cholesterol levels. Some studies link the cocoa found in chocolate with positive effects on overall cholesterol levels. 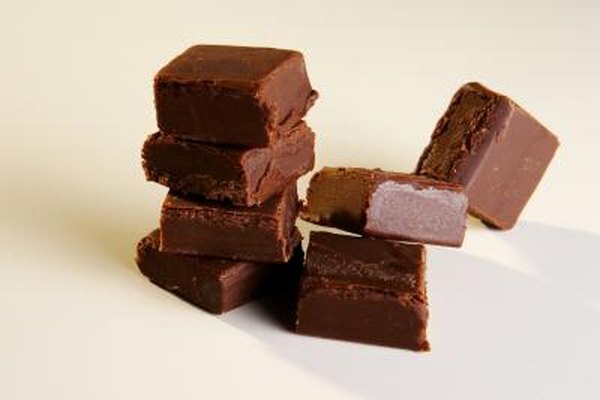 In a 2006 study published in the "Journal of the American Dietetic Association," participants who consumed a cocoa-enhanced snack bar daily over six weeks showed lower cholesterol levels. Similarly, a 2007 study published in "The American Journal of Clinical Nutrition" showed that people who consumed 26 grams of cocoa powder each day for 12 weeks experienced an increase in HDL cholesterol -- a beneficial form of cholesterol that can help lower unhealthy types of cholesterol. Chocolate contains substances called phenols, which are are partly responsible for dark chocolate's more bitter taste. These substances occur in particularly high concentrations in dark chocolate with rich cocoa content. A particular form of phenol known as flavanols that is found in chocolate may play a role in preventing unhealthy, LDL cholesterol from clogging blood vessels. These blocked vessels can eventually lead to heart attacks and other health problems. Some chocolate bars come fortified with substances known as plant sterols and stanols. Taking 2 grams of these substances each day can lower cholesterol by as much as 10 percent in those with high cholesterol levels, according to the Harvard Medical School Family Health Guide. However, not all chocolate contain high levels of sterols and stanols, so these benefits don't apply to chocolate in general. Much mass-produced chocolate in America is highly processed. The majority of chocolate available in stores contains added milk and lots of sugar, reducing the health benefits. In particular, this processing lowers the amount of flavanols in the chocolate. Avoid large amounts of milk chocolate and opt for more low-sugar dark chocolate, particularly if you are concerned about high cholesterol. The Harvard Medical School Family Health Guide; Take Two Candy Bars and Call Me in the Morning?